Detailed monitoring is being undertaken at Josh’s House in collaboration with Curtin University and the Cooperative Research Centre for Low Carbon Living to assess the performance of the various design features and technologies. 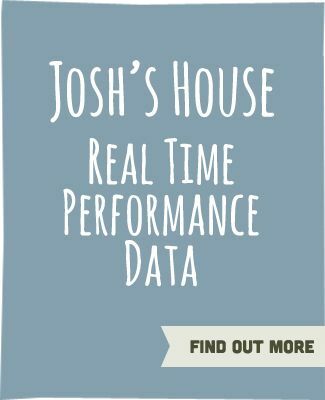 Josh’s House has an integrated monitoring system comprised of around 70 channels of data aquisition. This includes sensors to monitor local weather conditions such as temperature, wind, humidity, rainfall and solar radiation; internal room temperatures, as well as concrete slab, ceiling, roof cavity and roof surface temperatures; metering of all water sources (mains, rainwater, greywater, and bore); as well as electrical supply (PV system, battery and grid import/export) and electrical circuit sub-metering. This enables a detailed thermal and operational energy footprint to be determined for the complete site, including the energy intensity of water supplies for example, thereby enabling the performance of best practice sustainable design to be analysed and reported. The results are documented in a series of reports, papers and live data feeds which are shared widely.